Peel garlic and ginger. Halve the chili lengthwise and remove seeds. Crush garlic and remove green sprout if needed. Slice ginger and chili pepper and roughly chop garlic. Transfer all ingredients to a food processor. Roughly chop cilantro and transfer to food processor. Add mustard seeds, cumin, and turmeric and process into a fine paste. 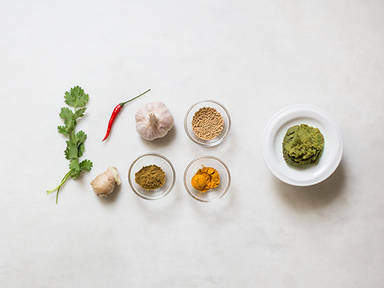 Enjoy as the base for green curry!